Most of today was really, really good. I had to do some business with the Government today. I did some shopping and I went down to the Maylands jetty so see what bird life was around. There was a beautiful black swan which I will post tomorrow. Because a wonderful day was ruined. 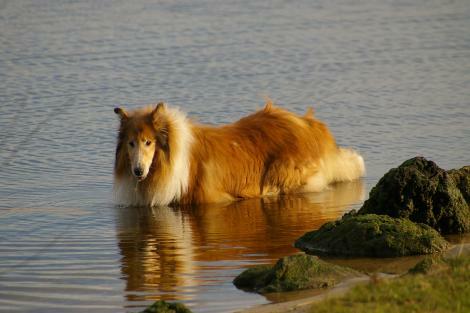 As I was leaving I spotted a beautiful collie dog. He walked into the river to have a drink. It was then that I realised something was wrong. He had no collar. I looked around for a possible owner. There was no one else in sight except another dog walker and his grandchildren. The Collie was looking at the other family who were on the jetty, then at me on shore, and then, deciding we were not the correct people, looking around as if looking for someone who should have been there. When the small boy from the other family ran to him and tripped over him he simply stepped to one side showing that he is used to children. But he had no people. No collar. No registration. He had been abandoned! I saw him wandering off into the undergrowth along the river bank. Probably looking for an unwary bird for dinner. Living in a “No-Pet” block of units, I was unable to give in to my natural instincts. I couldn’t take him home. At least the RSPCA is now looking for him. I began getting angry when I realised what had happened. Now I am just so sad with a very blurry keyboard in front of me. I hope he is found and that a family who will love him gets to have a wonderful pet. And I wish the nasty human who abandoned him a lonely miserable life! 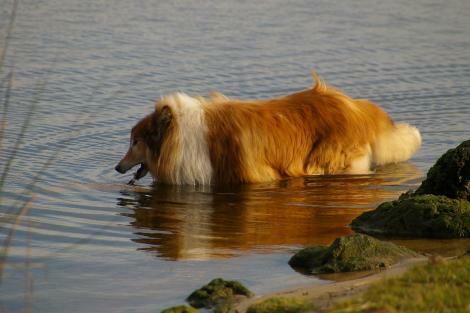 This entry was posted in lifestyle and tagged Abandoned, collie, dog, Maylands. Bookmark the permalink. Gorgeous dog, or would be if he wasn’t so thin. Having worked in an animal shelter for a year, I hate it when animals are abused, too. Especially since I am dependent on my service dog. Her story is here. I share you sentiments, Archie. People who abandon or otherwise mistreat their “pets” deserve a place in Hell’s hottest circle. I worked for five years at an animal shelter in the early ’90s and it was by far one of the most heart-rending, yet at times most inspiring experiences of my life. One thing is certain: people who abuse animals are also equally capable of abusing their fellow humans and are among the lowest forms of life on the planet. Let us know if you hear anything more about this beautiful animal. I just finished reading an awful story in my local paper about two dogs who were abandoned and almost starved to death. There are some things I can’t rationalize no matter how hard I try. I’ve heard similar stories. Often it is not the original owner who mistreats a pet. Sometimes, when the original owner is admitted to hospital or a nursing home, an inexperienced relative might inherit the pet which might then “accidentally” escape. It’s always so sad seeing an abandoned animal, but especially a dog. A few years ago my friend’s sister was going home for Christmas by bus. As they were driving along she saw a small puppy on the side of the highway that had clearly been abandoned and, acting on impulse, called out to the driver to stop the bus. And to her surprise he did! She got out of the bus, bundled up the puppy, and took him home. He was not only a wonderful Christmas present for her parents but he lived a very long and happy life. 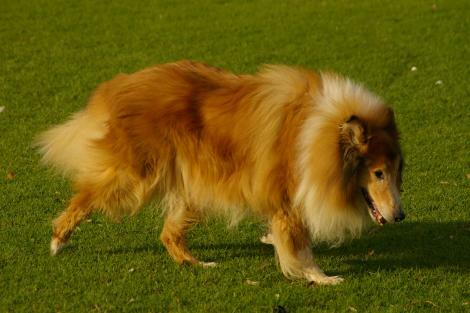 Maybe your beautiful collie will also find a happy ending. 😥 No fair … THIS is is why you don’t live in flats! This is why EVERYONE needs a back yard! Please follow up this beauty and hopefully he’ll either find his human … he looks, other than a bit thin and shaggy, that he may have been loved once … Collies tend to get matted very quickly and he’s obviously not so maybe there IS a grieving owner somewhere who is looking for him. I do hope so … or maybe the RSPCA will find him a new human who will love him. Fingers crossed. UPDATE – I looked for him this morning after the RSPCA had told me he hadn’t been found. No sign of him so either he has been picked up by the council and taken to the pound or he has found a new human. I will keep an eye out for him over the next week, just in case he is hiding in the bush somewhere along the river bank. He’s such a beautiful dog, Archie, I’m sure someone will take care of him. It’s a great shame that someone can’t be you, though. Were i not so far away you could send him right to me. I live in a very rural area. I have had many wonderful dogs and cats show up at my door after someone dumped them. I took them in. These were the lucky ones. Only a small percentage of these abandoned pets are lucky enough to find their way to the door of someone willing and able to care for them. I suppose the mentality is dump them in the country and they will be taken care of by some kindly country folk. This is the reality for only a few lucky ones. Most either become lost and die a slow, fearful, and agonizing death from exposure or starvation, or become prey to mountain lions, coyotes, bobcats, hawks, and owls. I’d love to see the same fate for anyone cruel enough to abandon (or abuse) an animal. Reading this had me in tears. I do hope he’s found. How could any one abandon him – makes my blood boil. @ Litlove, I agree. I am a sucker for that sort of dog. @ Cybe, You I would trust to love him. He would love the Wizzards Tower. @ Blue, Mine is calming down now – but yes, I was in tears as well – not a good sign in a curmudgeon!